“On Monday, 28th January, 2019, we received textbooks for the major subjects of English and Mathematics. During the first term of the school calendar, we also received exercise books, which we distributed to all the pupils,” he said. 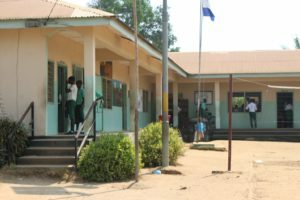 “Despite the influx of pupils, we have strictly followed the policy of 50-pupils per classroom. We don’t allow overcrowding in our classrooms because we want pupils to take-in what they are taught. During the re-opening of schools in September, there was a mad rush by parents, who wanted their kids to benefit from this national programme, but we had to put a stop to admission in order to accommodate the kids we could cater for,” he noted.